The Design stage involves working out the details of project activities and how they will be implemented. At this stage the project development team will draw on the information that has been collected through the assessment process. Identifying clearly defined outputs, outcomes and goals that can be used to monitor and evaluate the success (or failure) of the project. The overall goal of the field work conducted during the design phase is to facilitate a medium-term village action plan which provides a framework to propose activities to overcome development challenges at the village level and to set achievable development objectives to improve well-being. For the development of the village action plan, all households in the village have to be invited to attend a village planning meeting. The village planning meeting should start with a review on field results from the assessment (PLA tools) to highlight difficulties, issues, solutions and activities proposed by households participating in the assessment field work. Moreover, a short overview should be presented on the targets and implementation progress of existing government district/commune/village Socio-Economic Development Plans. A good practice for making sure that views of different people are included is to divide up villagers into sub-groups (e.g. men, women, boys, girls) to (1) discuss and propose activities and objectives for the village action plan and (2) rank priority objectives and activities for different thematic areas (e.g. food security, health, education, etc.). The final output of each sub-group meeting is a list of objectives and prioritized activities per thematic area. The elaboration of a joint village action plan is the logical consequence of sub-group meetings. 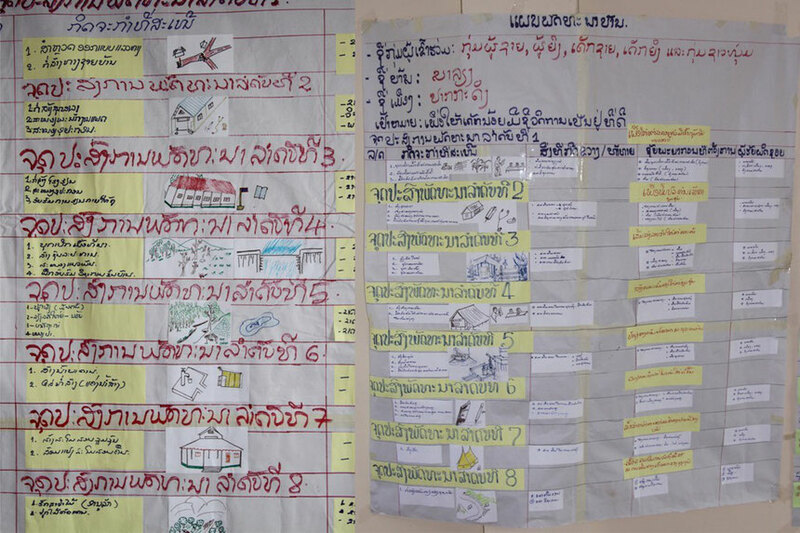 Village action plans should be detailed showing contributions of different stakeholders (e.g. villagers, government, development project) people in charge of the implementation process, progress indicators, […]. The more specific the formulation, the easier the justification of activities, and the better the chance to get the specific support for implementation. Ideally, village action plans have a mid-term time frame (3 to 5 years) which makes the plan more flexible in terms of its approval, the negotiation for its financial support and implementation. Later, the results from different villages will be analyzed in a district planning meeting and compiled into a district development plan which will be used as the basis for developing the project Logframe. It is critical that there will be a strong follow up on the implementation of village action plan so that villagers won’t lose interest in participating in future planning efforts. Therefore, it is necessary that villagers, government services and development projects are committed to contributing and supporting the plan implementation. Representatives from district Government and other NGOs working in the target should participate in village planning meetings to allocate funding based on the priority activities raised in village action plans. Tool 19 in the Toolkit for Child Focused Program Design provides a detailed description on how to organize a village planning meeting and develop a Village Action Plan. How the project’s achievements will be monitored and evaluated (Indicators and Sources of Verification). 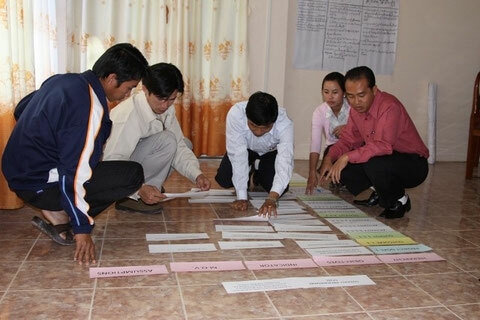 A good Logframe is crucial to strengthen results-oriented management, monitoring and evaluation.